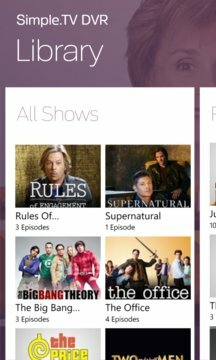 Published by Really Simple Software, Inc.
Simple.TV turns your Windows Phone into a fully featured DVR and television! With a Simple.TV DVR (separate hardware purchase required - learn more at www.simple.tv) you can watch live and recorded TV, browse our rich EPG (electronic program guide) to find out what’s on, or set up a series recording so that your favorite shows will always be ready when you are. Dual-tuner models let you record two shows at once while you’re watching another! 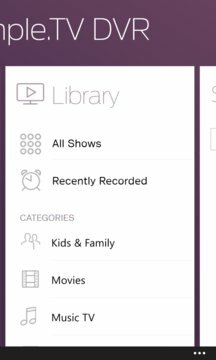 With this companion app and a Simple.TV DVR, you’ll always have access to your shows as long as you have a 3G, 4G, LTE, or Wi-Fi Internet connection.